Analysis of Financial statement is one of the most important techniques that the management uses in order to analyze the performance of the companies. Financial statements show the financial performance of the companies and these statements are used by different users in order to analyze how the company has performed finally. Moreover, historical performance is a good predictor of how the company would perform in the years to come and therefore many users use these financial statements to analyze how the company would perform in the years to come. Financial ratios are another important way through which the management and other users of the financial statements analyze and compare the performance of the company with other companies or industry. Financial ratios are helpful as these ratios allow the users to compare companies of different sizes and magnitude. For instance, with financial ratios one can compare two companies; one with assets of more than €1 billion and the other one that has assets of only €0.5 million. Thus these financial ratios allow and help the management as well as other users of financial statements to compare one company with the other and thus it makes comparison possible and practical. Moreover, organizations and management use these financial ratios to set benchmarks and to set targets. Therefore these are an important way to set objectives of what the firm needs to achieve financially. Was going to write the essay about abortions, has made the plan, but you have not enough material for the introduction? Well, ask for consultation at Pro-Papers support concerning your abortion essay intro and our writers will help you. There are varieties of methods used by organizations for performing financial analysis of the companies such as vertical and horizontal analysis. Analysis of financial statements is of utmost importance as this information is utilized by investors, managers and businessmen to make business and capital decisions. Horizontal analysis allows the management to trace and track changes over a period of time. On the other hand, vertical analysis allows the management to compare each element in the financial statement and their impact. This report has presented the financial analysis of two of the leading airlines of the world, Ryanair and easyJet. The report analyzes the financial statements of the two companies and then different financial ratios have been discussed individually. The report starts with the introduction of the overall report along with the different sections and parts that the report covers. The report not only uses the theory related to financial management and financial analysis, but uses these concepts and theories in interpreting the results and in analyzing the performances of the two companies understudy. Moreover, the researcher has also come up with his own analysis as well as has tried to analyze the changes in the financial statements of the two companies with the annual reports and the overall changes in the industry. Thus a relation has been setup by the researcher from the analysis and interpretation of the financial ratios. After the overall introduction of the report, the report covers the general overview of the two airlines and then identifies performance of the two companies over the last few years. Moreover a brief description along with the highlighting some important aspects of the history of the airlines along with important statistics have also been presented. The report also identifies general trend of how the company has performed not only financially but from other aspects as well like arriving on time, customer satisfaction level etc. The report then discusses about much more important part of the report i.e. the financial ratios. The financial ratios have been divided into five categories according to their nature; however this report discusses only four categories and investment ratios have been excluded. Four categories of financial ratios have been described and each of ratios included in these categories have been defined and analyzed one by one. The researcher has adapted a specific pattern i.e. to first discuss the theory and defining the ratio and after defining the ratio in detail, the researcher has analyze the financial statement of first Ryanair and has calculated that particular ratio for the airline. Once the ratio has been calculated interpretation and the reasons for the change in the ratio over the period of time has been discussed. Moreover, to discuss the ratio in more detail the researcher has adapted a strategy to highlight each element or component of the ratio and analyze the change in that particular element as well because the changes in each particular element would result eventually in changing the main ratio. Therefore this strategy has helped the researcher in more closely analyzing the reasons for the changes that are being occurred in the financial statements and financial ratios. Once the financial ratios of Ryanair have been discussed the researcher uses the financial statements of easyJet and then calculates the ratios for easyJet and analyzes them as well. The same strategy has been followed to analyze the financial ratios of easyJet i.e. each component is individually analyzed and then the changes in the ratio has been discussed. Once all the financial ratios have been discussed, the report uses the other important techniques to analyze the financial statements i.e. vertical and horizontal analysis. Vertical analysis has been helpful in analyzing each of the elements of the financial statement individually as well as their impact on the overall financial statement. So first the income statement of Ryanair has been analyzed vertically and then the income statement of easyJet has been vertically analyzed. Then the report analyses the balance sheet of Ryanair vertically and then the balance sheet of easyJet. The report then moves to analyzing the financial statements horizontally i.e. changes in each of the element of the financial statement would be analyzed on year to year basis. First of all, the income statements have been analyzed of both the airlines and then the balance sheets. The report then gives a brief comparative analysis, although the researcher has made an attempt to compare the two companies side by side. However this section of the report discusses the comparison of the two companies in a summarized manner. The report then gives the conclusion of the overall report and provides recommendations for the two companies that can help them to improve their performances. Financial ratios are the relative measures that are taken from the financial statements of the organization and used to analyze the company and its performances. Financial ratios are the most extensively methods that are used by financial analysts, management, organizations, competitors, suppliers, distributors, economists, investors, shareholders, governmental agencies etc. in order to analyze the financial performances of the company. These financial ratios are not only used to analyze the performance of the company with its own performances but these ratios are also used to analyze the performance of the company with the performances of the competitors and industry. Financial ratios are used to present how the company has performed over the last few years. Moreover, these ratios are helpful in identifying the major strengths and weaknesses of the company. So by identifying the strengths and weaknesses of the company, stakeholders of the company are able to make their decisions accordingly. For instance, investors would be willing to invest in the company if the company is yielding good returns and has a bright future. Similarly, suppliers and distributors would like to work with the company if the company is able to pay its payables in quick time and does not default. Therefore distributors and suppliers would be using the financial statements and calculating the ratios such as efficiency ratios, average time period to pay the payables etc. Moreover, suppliers and distributors would also be interested in knowing the profitability of the company as if the company is not able to earn good profits then its future would be in danger and thus, stakeholders of the company analyze and use financial ratios to identify the strengths and weaknesses of the company and how the company and its financial performances can impact their business. In the same way, other stakeholders would be using these financial ratios such as competitors. Competitors would be keeping a close eye on the financial statements of the company and financial ratios and they would be identifying areas where they can improve their profitability and how their company can improve their efficiency, profitability and productivity. Thus, financial ratios are very important for every stakeholders of the organization because the financial performance of the company can directly or indirectly influence each stakeholder. Financial performances are one of the most important ways of measuring and analyzing the performance of a company and financial ratios are used for this purpose i.e. to analyze the financial performance of the company. Financial ratios are not only used to analyze the performance of the company with the previous years’ performances but these ratios are also used to analyze the performance of the company with the performance of the competitors as well. Moreover, these ratios are used to analyze how the company is performing in comparison to the overall industry. Financial ratios also reveal whether the firm is performing better than the industry or not. Moreover, financial ratios are also used by the management for benchmarking and they set their targets according to either some of the top companies operating in the same industry or according to the overall industry averages. Therefore these ratios are helpful for the management in setting up or targeting where they should be and what they want to achieve. Financial ratios can be a good predictor of how the company would perform in the years to come and therefore these ratios are also used by the management of the organizations to analyze and predict how the company would perform in future. Moreover, financial ratios are also used to identify the trends of the company and whether the trends of the company are positives or negatives. In addition to this, using financial ratios are helpful in identifying areas of costs that are too high and thus the management can take steps to reduce the costs and improve their profitability. Therefore financial ratios are used by management for a number of reasons. The usage and purpose of these ratios also varies according to their needs of the users. Looking for analytical essay definition on different sources but still have no clue about this kind of work? Please, visit Pro-Papers article on analytical essays and to know a lot about it or even to buy yourself this paper cheap. This report uses financial ratios of two firms in the airline industry; Ryanair and easyJet. Different financial ratios of the two companies are used to analyze which of the company has performed well. The report uses different types of financial ratios which can be broadly divided into the categories of profitability ratios, efficiency ratios, liquidity ratios and financial gearing ratios. Financial statements of Ryanair and easyJet have been used for the last four years in order to analyze how the two companies have performed over the last three years. Financial ratios are calculated of these two companies and then compared which of the company has performed better on that particular ratio. Moreover, analysis has also been presented simultaneously with each ratio. Moreover the report also uses the financial statements of the two companies since 2009 to do to vertical and horizontal analysis as well. This would be helpful in identifying the areas where the company has changed or where the costs or revenues of the company have changed in the last four years. 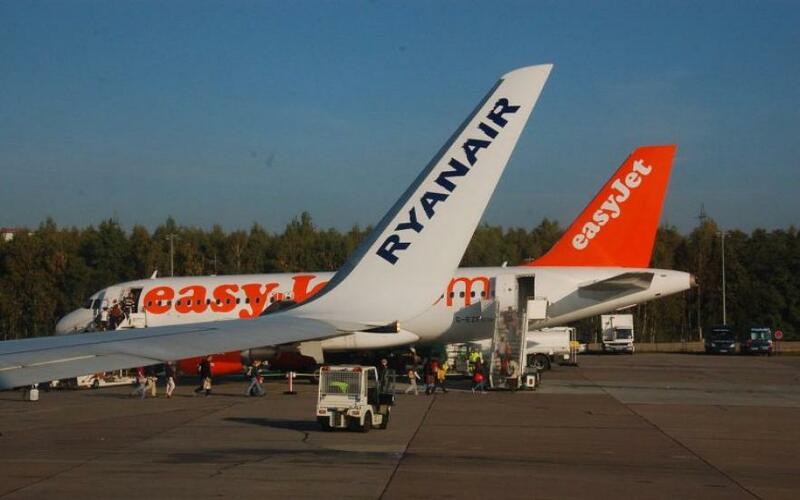 Then the report compares the two companies and provides a comparative analysis of Ryanair and easyJet. Then the report concludes the overall report. The last section of the report provides recommendations that the management of the two companies use adapt in order to improve their position and profitability.